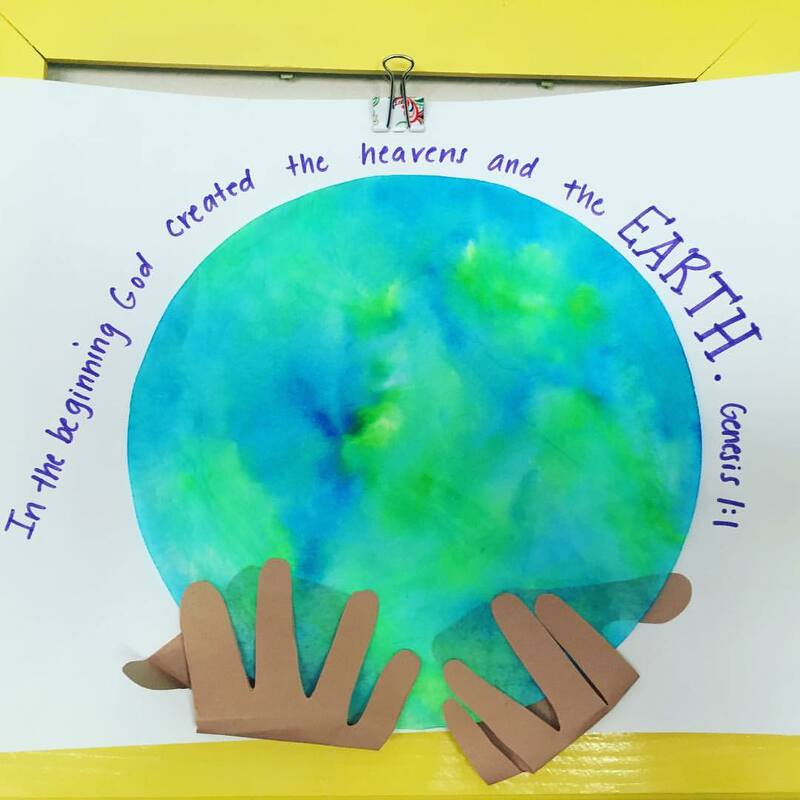 I’ll highlight a few of the fun ones we did get to as I’m sure you’re not so interested by the worksheets. We made a dandelion using q tips, a cotton ball, and a pipe cleaner. She simply glued the cotton ball on the top center of a piece of paper then glued the q tips around it. 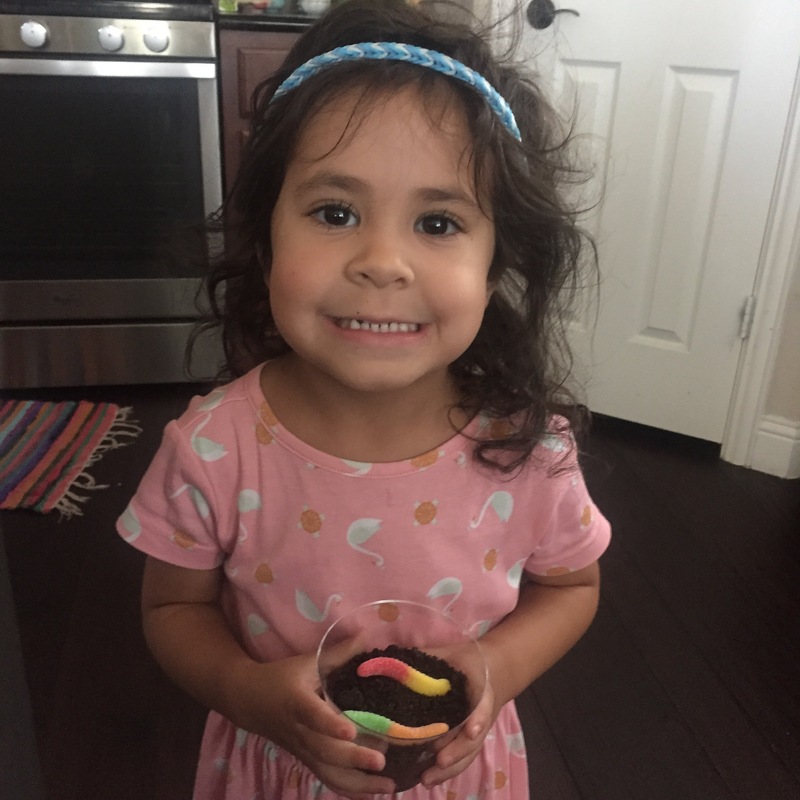 I made a pipe cleaner stem and we were done! We also used a paper plate to make a donut. 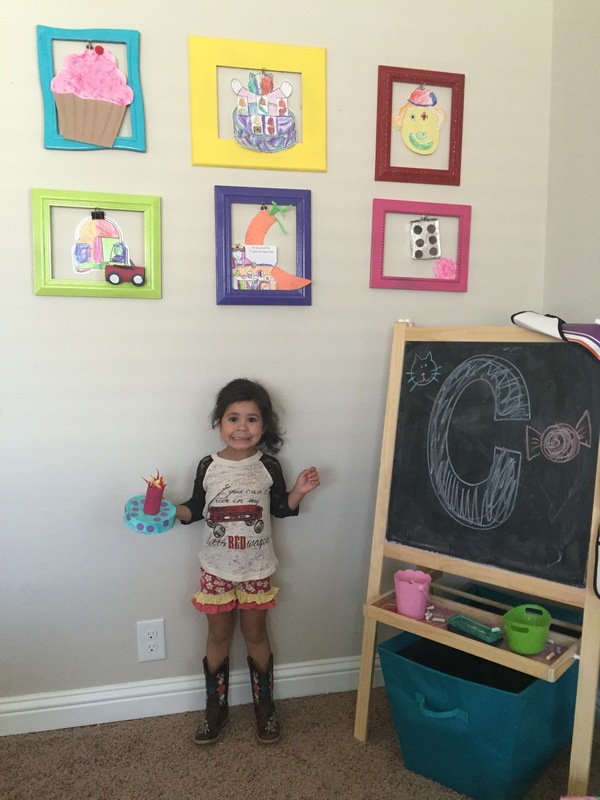 She painted it and then glued on real sprinkles. For the duck, I cut out a D from yellow construction paper as well as a half circle wing. I made a heart shaped beak and triangle feet from orange paper. She glued all the pieces on and added some yellow tail feathers and goggly eyes. For the dino feet, I let her paint 2 empty (okay fine, I had to empty them but we are still totally using the kleenex! lol) kleenex boxes. I free cut 4 orange triangle claws per foot and let her glue them on. We then took green construction paper cut into strips and made the hat. 2 around the head and 1 across the top. I then let her glue on green triangles all around the top. She got a kick out of this and is still parading around in this outfit today! 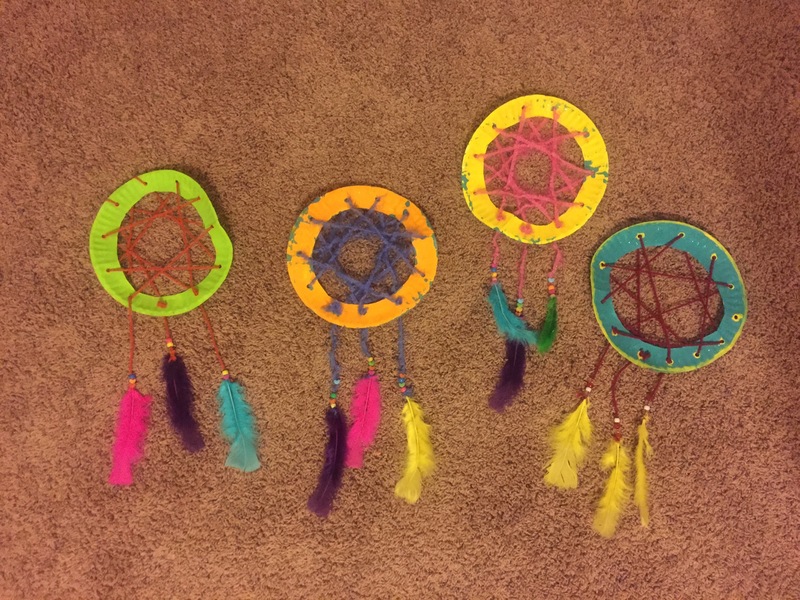 Our favorite project for D however was the dreamcatchers. The big girls begged me to wait until they got home from school for this one and everyone had a blast! I took a cheap paper plate and cut the inner circle out. Then, using this template as a guide, we used a hole punch to create 11 holes around the outer edge of the plate. 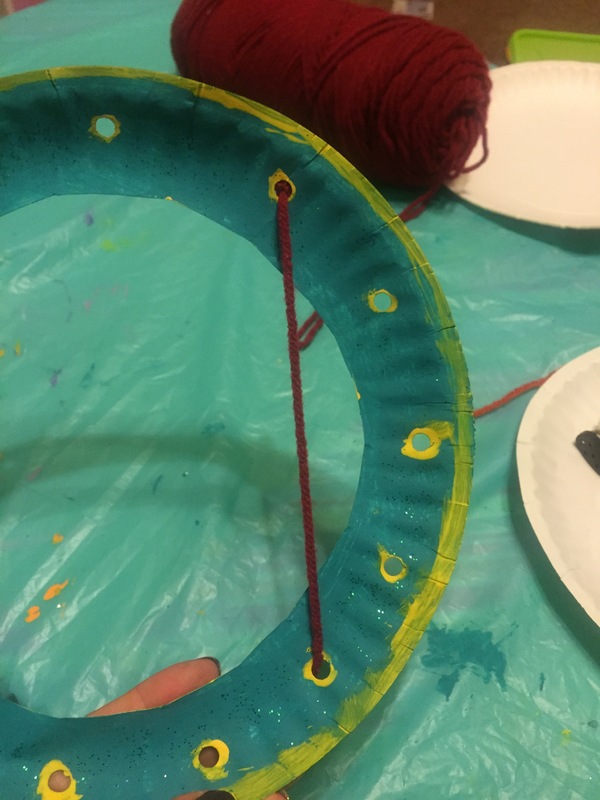 While they painted their plates, I cut long pieces of yarn for them to use. I didn’t measure, but I would guess about 3 feet just to be safe. They weaved the yarn through every 4th hole as the above mentioned blog suggested and it worked well. 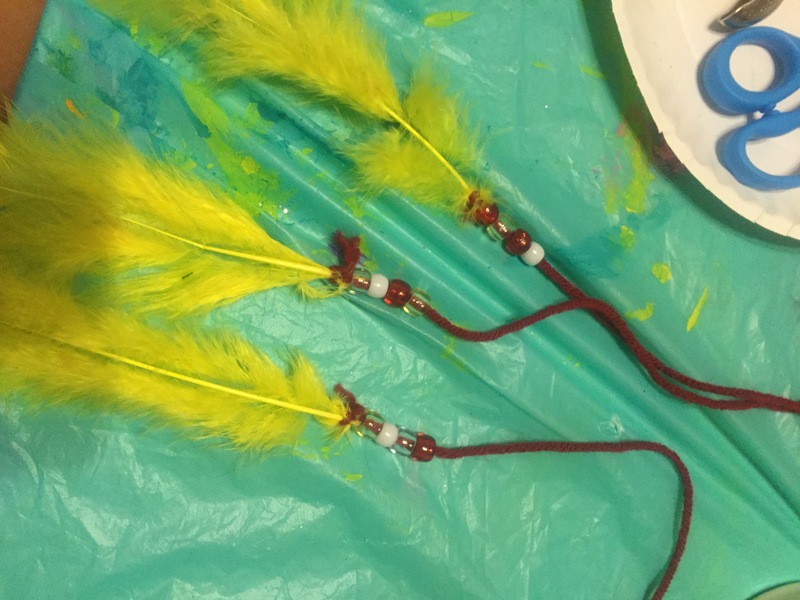 We finished by stringing beads and tying feathers to 3 small strips of yarn and then tying them to the 3 bottom holes. They turned out so cute! For the eskimo I sort of just free sketched the body, hair, mittens, and boots. They don’t have to be perfect. We used a coffee filter as the fur around her head, and cotton balls as fur accents on her coat. We printed and cut out this eagle template from construction paper and then traced her hands for the wings. Simple and so cute! 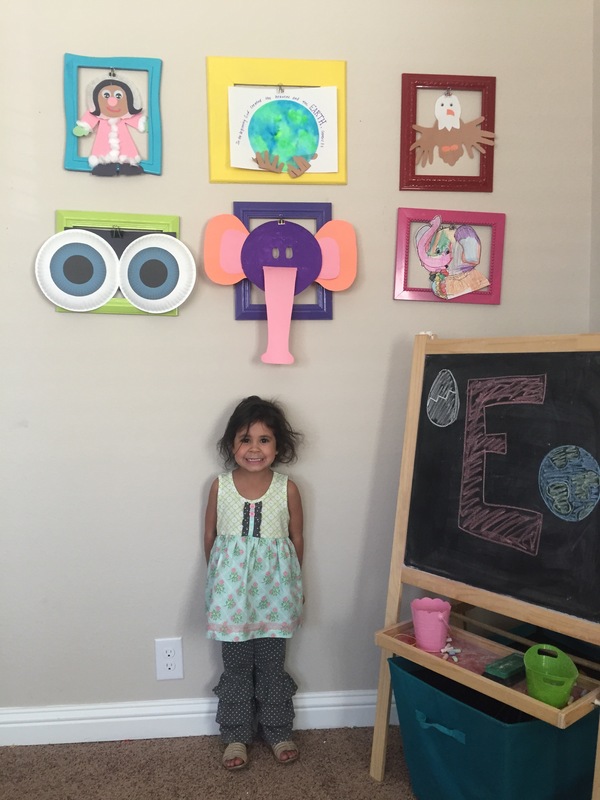 For the elephant mask, she painted a paper plate and I cut out eye holes. I cut the ears and trunk out of construction paper and she glued them on. 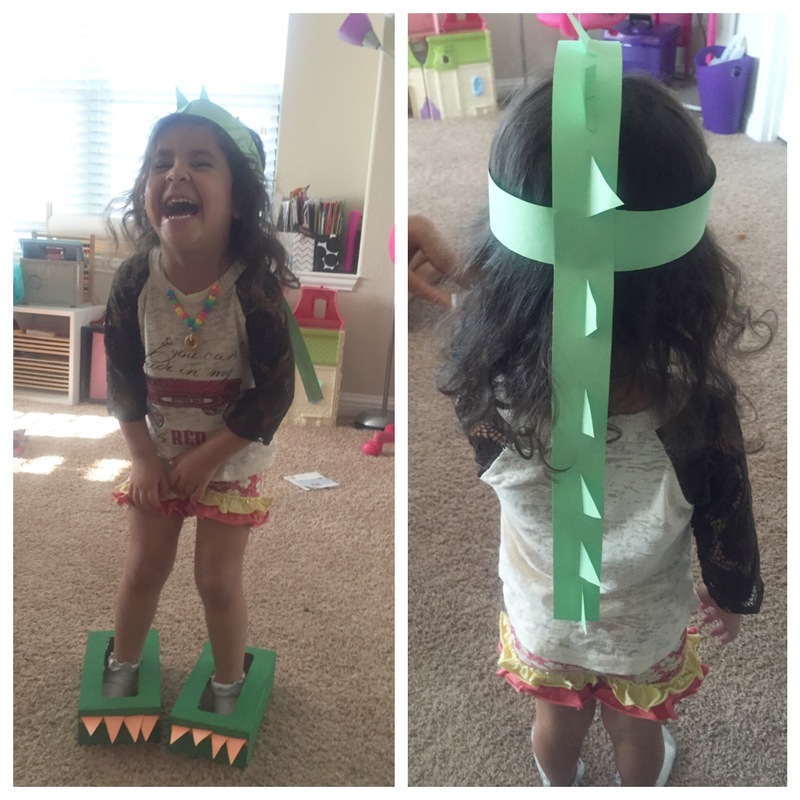 We also added a large craft stick (can be seen by lifting the trunk) so that she could hold it up to her face. The giant eye balls were printed from here and then glued onto paper plates. We then glued the eyes onto a strip of construction paper so they would stay together and hang easily. We dyed eggs with a kit I had leftover from Easter as our cooking craft. We used a few F worksheets we had in our file so I don’t have links for those. We made the fox by folding a paper plate into fourths. She then painted it and glued on the eyes and a puff ball nose. 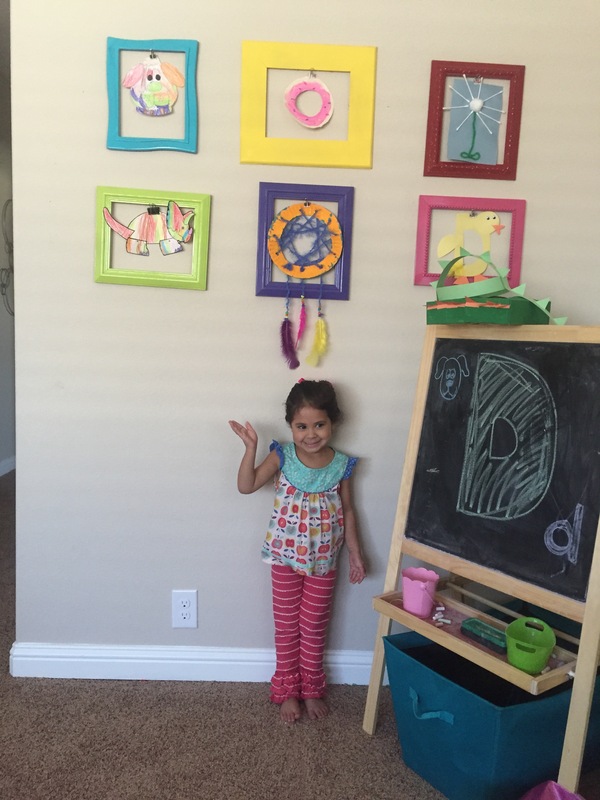 She wanted a girl fox so I cut 2 small triangles and a circle and let her make a bow out of them. 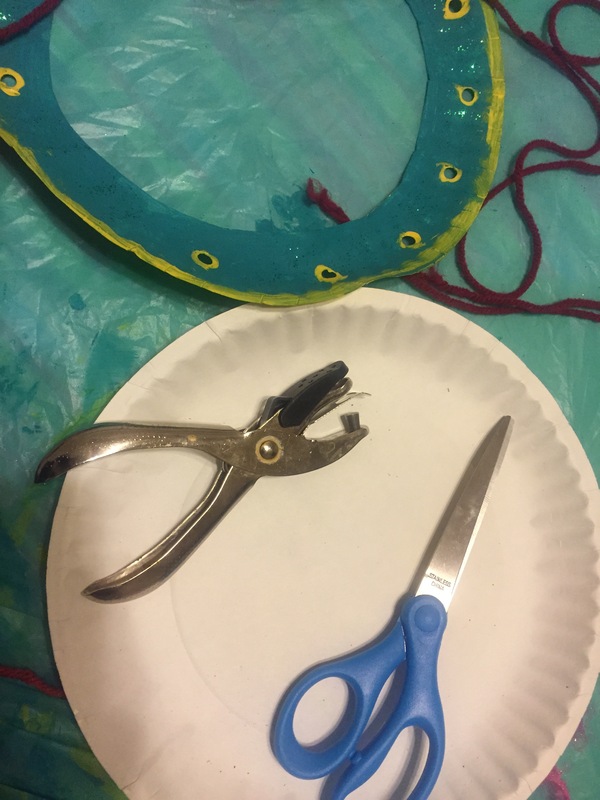 We cut triangle ears from construction paper and glued them inside the folds of the plate then glued the whole thing shut. We printed and cut this fireman template and then A colored it (rainbow of course, it’s always rainbow lol). We then glued it onto a toilet paper roll. 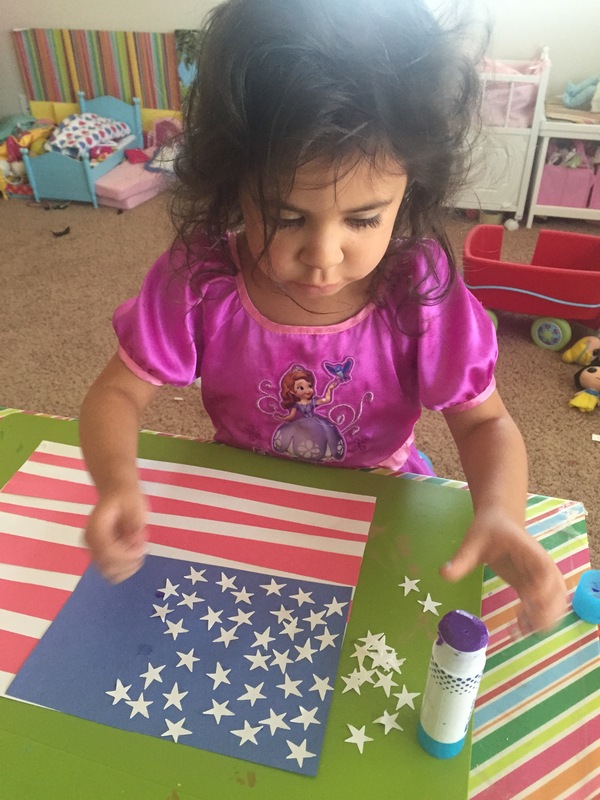 I cut the stars and stripes from construction paper and let her glue them on. I used a scrapbooking shape cutter for the stars and it was super quick! A and I have been working on a letter of the week project since the big girls started school. We’ve done really well with keeping up with it thus far and I love that she’s learning AND having a blast doing it. 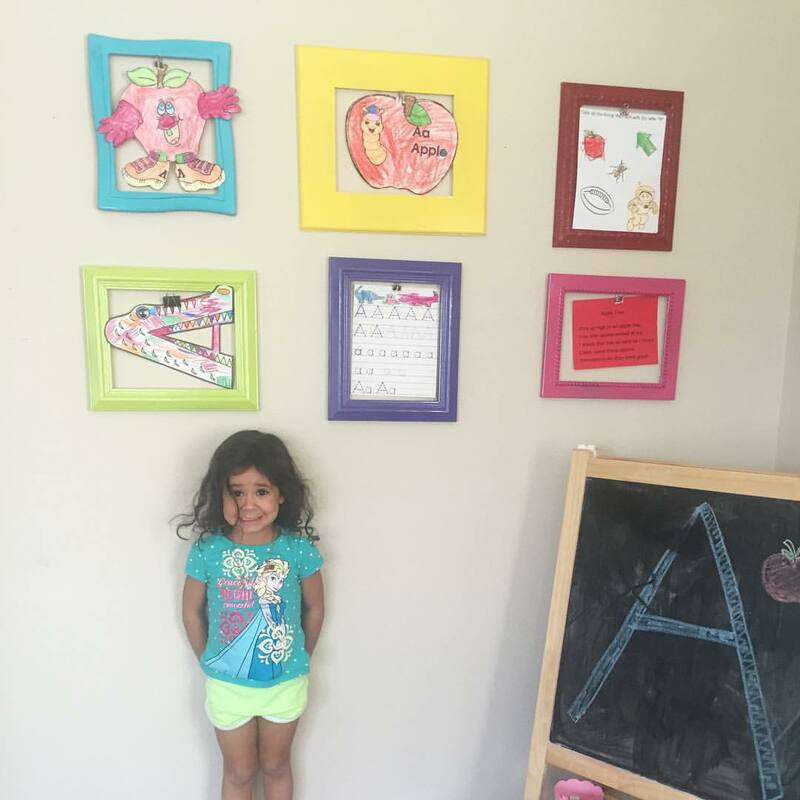 I’ve spent hours scouring pinterest for letter activity ideas and thought I would share some of the things we’ve been working on thus far with you guys. We will start the letter Ii next week so I’ll get you that far then add more letters as we complete them in case you want to start working with your little too. I’m going to do 3 letters per blog post that way you can easily find inspiration for just a specific letter you need without scrolling through the entire alphabet at once. I’ll give you a list of words we came up with for that letter (we didn’t use all the words but you may come up with something for them), I’ll show you what we worked on some, and give you some ideas for snacktivities too. 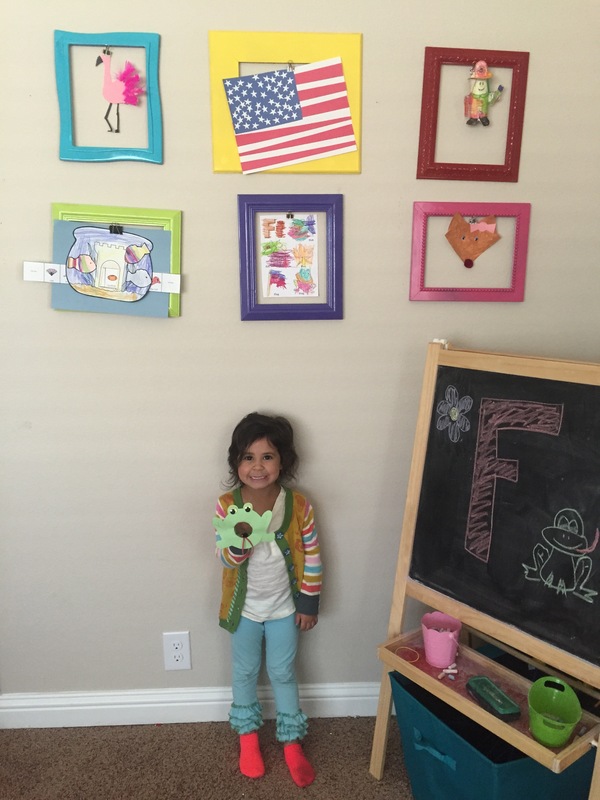 We created a display wall of brightly painted picture frames with binder clip hooks to display her work each week near her chalkboard. Hope this helps! 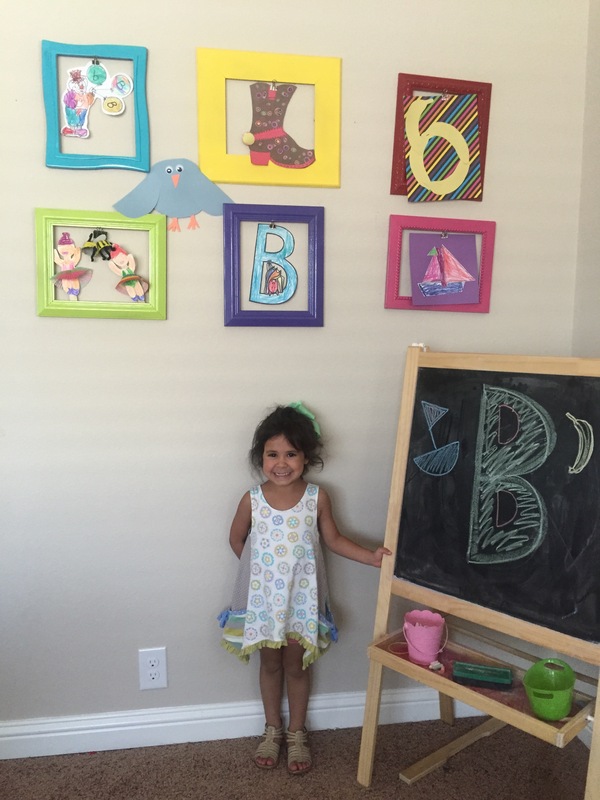 I tried to plan worksheets, crafts, and a cooking project for each letter. 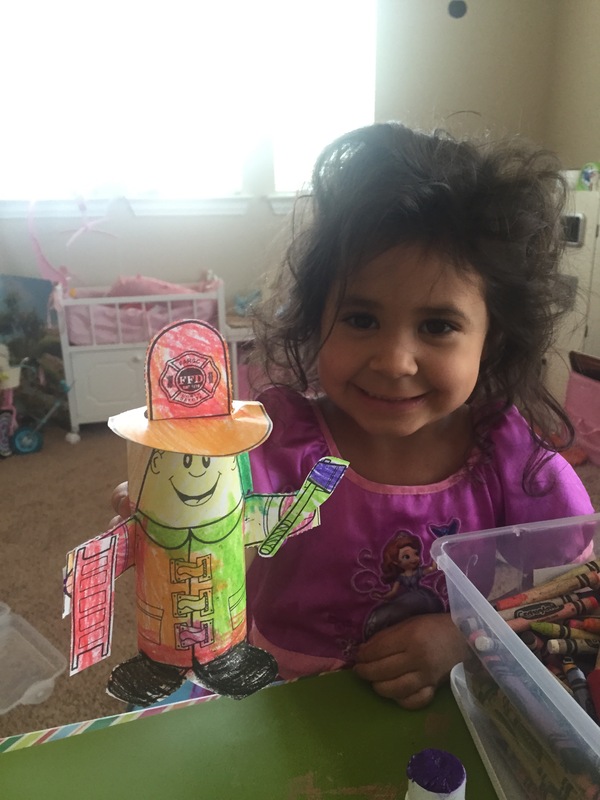 A few ideas for craft supplies we keep around at all times that you may consider stocking up on: Construction paper, toilet paper and paper towel rolls, cheap coffee filters, cheap paper plates, craft sticks, goggly eyes, tissue paper, feathers, glitter, paint, cheap shaving cream. We got most of our supplies at dollar tree! I was very fortunate that a friend’s mom gave me a box of preschool goodies organized by letter when P was this age and I’ve used it with all 3 girls now! It’s so special re-living each letter with A and remembering how the other girls did it a little different. 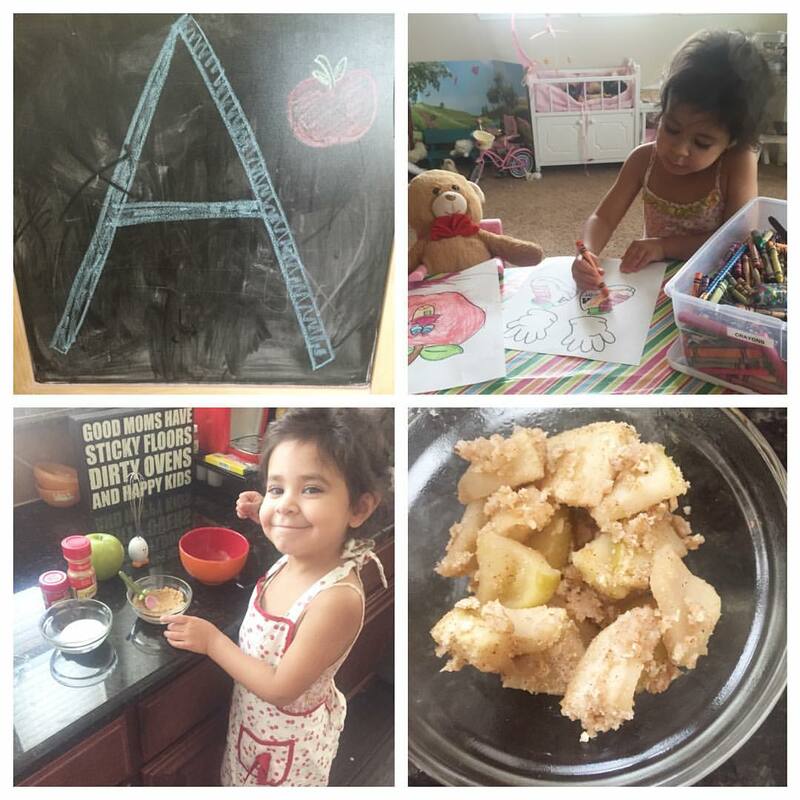 I’m not much help with letter A as it was our first letter and I wasn’t all that prepared and original with our work 😦 For our cooking project that week we made an A-A-Apple crumble. Simple and yummy! For this, we used an apple slicer on the apple and then cut those thin slices in half. For the crumble we used about a tablespoon of steel cut oats, a dash of cinnamon, a sprinkle of coconut flour, and about 1/2 a teaspoon of brown sugar per 1 apple. We arranged the apple slices in a single layer on a baking sheet and sprinkled with our crumble. We baked them at 350 if I remember correctly for a few mins until the apples were soft. We found a nice printout of a clown holding some balloons and I wrote B on each balloon and let her color it. 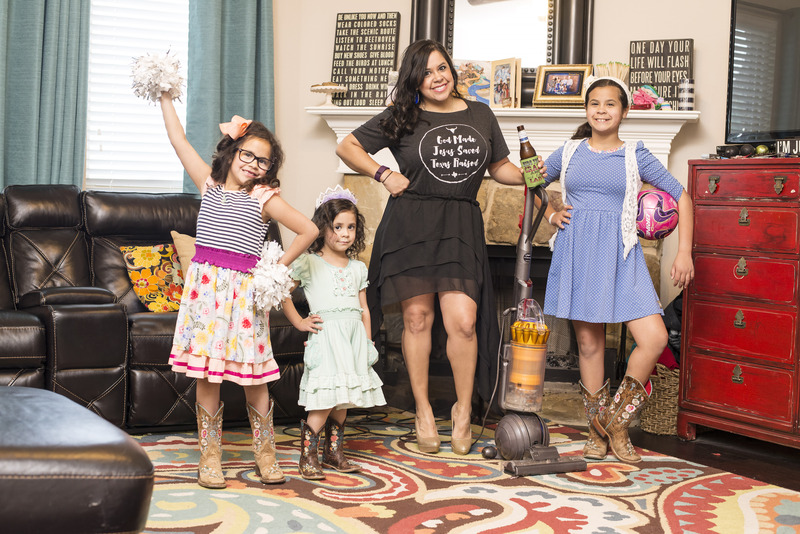 The boot was one of my favorite projects, because well, TEXAS! lol We used this template. I printed it and cut out each piece individually on construction paper. Then I let her glue all the pieces on and decorate it with stickers. I drew the stitching on with a marker. But you could just print this and have your little decorate it instead if you wanted to save a few steps. For the bird I cut out 2 large circles from construction paper. We cut one of the circles in half for the wings. 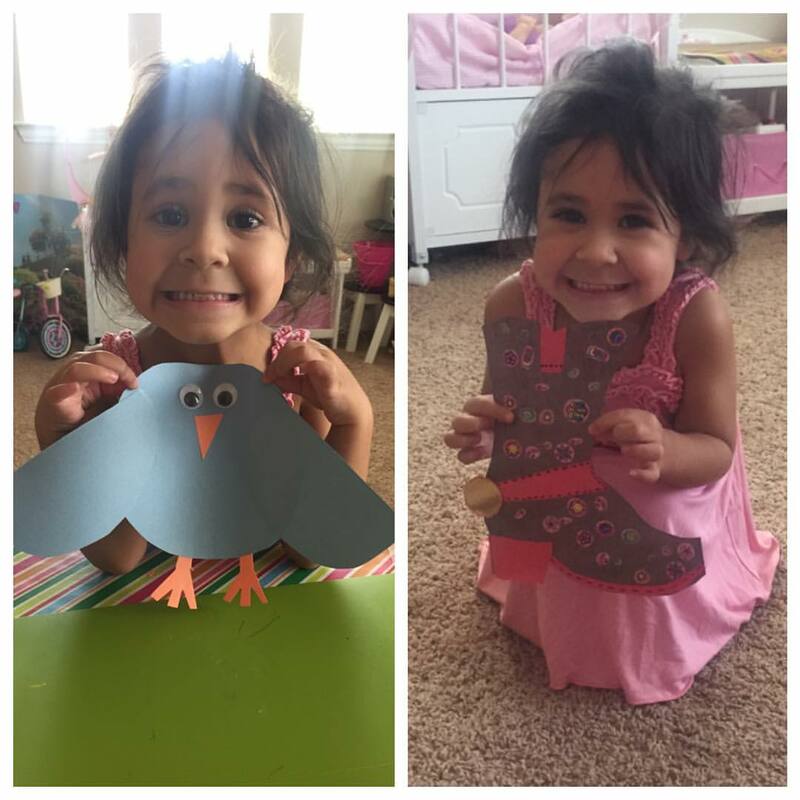 I cut the feet and beak out of construction paper and let her glue on goggly eyes to finish. Super quick, easy, and cute! unfortunately, the whole blog is in spanish but you get the idea. 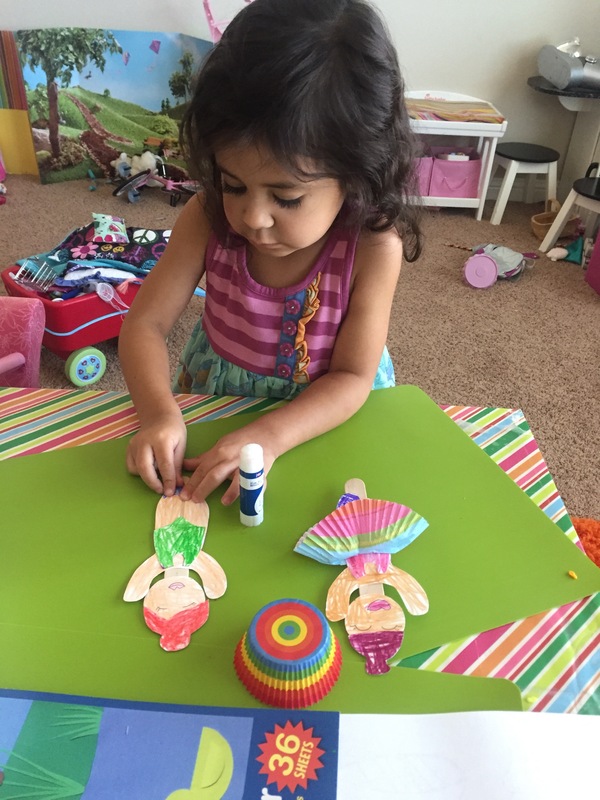 I printed the ballerina templates, traced them onto paper (I planned to use construction paper, but A wanted to color them herself instead), we cut them out, glued them onto large craft sticks then added a cupcake liner as a tutu. She loved these! We used an egg carton to create the bumble bee. I cut to little cups off and hot glued them together for the head and body then let A paint it. We glued on goggly eyes, pipe cleaner legs and antenna, and paper wings. So cute! We made banana pudding as our cooking project that week. We made a giant cupcake out of construction paper. I just free drew and cut it then we used shaving cream mixed with pink paint as “frosting”. She sprinkled the top with tiny seed beads while it was still wet. I don’t know why we had never used shaving cream to paint before because it was super fun! We used it to frost our “cake” the next day too. To make the cake, I cut out 2 large circles from construction paper. 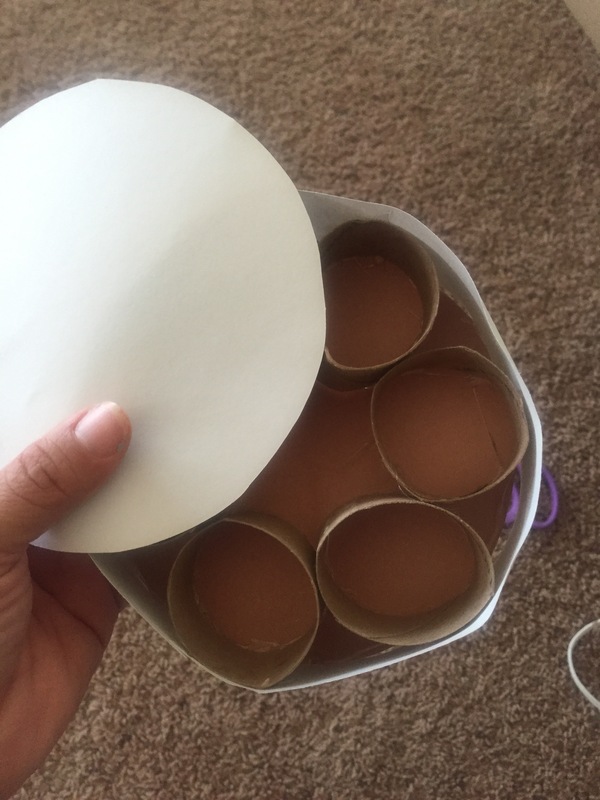 I cut up toilet paper rolls to line the bottom circle (we save these for spirit sticks for cheer and they make terrific craft supplies!). I then glued on the top circle and then cut a strip of paper to cover the sides. A then painted the icing on and added paper polka dots for decoration. 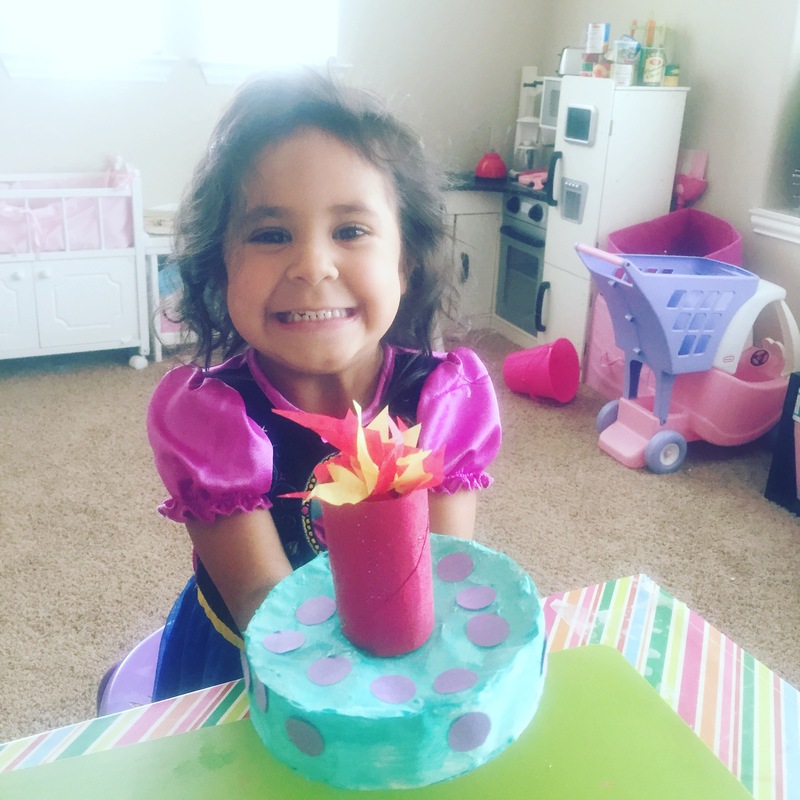 She wanted a candle on it so I let her paint another slightly trimmed toilet paper roll for that then I let her tear tiny pieces of tissue paper and stuff them in for the flame. I cut tiny cookies out of brown construction paper and let her draw on chocolate chips with a black crayon. We made a baking sheet out of some aluminum foil. For the carrot, I just cut out a large letter C with a pointy bottom from orange construction paper and let her stick green pipe cleaners in the top. We also made a car from a toilet paper roll. I cut out a top seat area leaving a tiny lip for the windshield. While she painted it, I cut out small circles for the tires and steering wheel. She loved it! For our snack we made cookies of course!